Mr Jones of Manor Farm is so lazy and drunken that one day he forgets to feed his livestock. The ensuing rebellion under the leadership of the pigs Napoleon and Snowball leads to the animals taking over the farm. 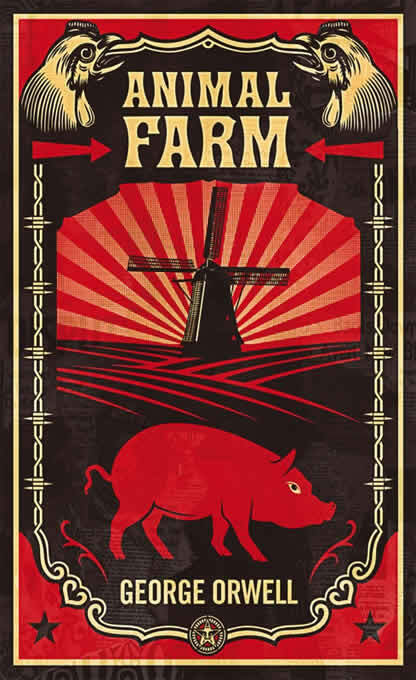 Vowing to eliminate the terrible inequities of the farmyard, the renamed Animal Farm is organised to benefit all who walk on four legs. But as time passes, the ideals of the rebellion are corrupted, then forgotten. And something new and unexpected emerges. Animal Farm is one of the books everyone was forced to read in school. Although this tends to give people an intense hatred for it (“Ah, yeah, read it school, hated it,”), I think it's a good thing to read this at a younger age. Don't get me wrong, I have finished it today and enjoyed it entirely (at the grand old age of twenty-five); I just think the message Orwell gives about power is an important one, particularly for younger people. Although the allegories to the Russian Revolution, communism, Stalin, and the USSR do not escape me here, I cannot pretend to be well-versed in any type of political affair, and wouldn't like to comment in case I make a bit of an arse of myself. I do, however, enjoy the messages Orwell gives here with regards to governments changing the rules and/or moving the goalposts, the lower classes being taken advantage of, and how powerful people (or powerful pigs) can corrupt socialism as they see fit. Orwell shows us the merits of communism and allows us, in the beginning, to support the animals' revolution. Then we are shown that communism really can only work in a selfless world. The pigs begin to discover human comforts, change the rules, and work the animals (the lower classes) to the bone before advising them that although all animals are equal, some animals are more equal than others. I have to mention my favourite part of the book. It's been my favourite since the first time I read it (I was maybe sixteen), and remains my favourite part ever since. It may be a spoiler. One of the rules of the farm is that no animal should ever drink alcohol. However, the pigs find a stash of whisky one night, and the leader, Napoleon, ends up doing a lap of the farm with the farmer's bowler hat on. The next morning it is announced he is dying and alcohol is now banned. By the afternoon he feels better and announces the farm will start growing barley. I lose my breath laughing every single time. The book is packed full of symbolism, but my favourite symbol is Moses the raven who seems to symbolise religion, or the church. He tells the animals of a great place behind the clouds called Sugarcandy Mountain, where they will all go when they die. He eloquently describes the endless sugar and linseed cake which can be had. Although some animals buy into this, and some animals don't, Orwell seems to use Moses to show how the oppressed can be soothed by religion, or something to believe in. This is a wonderful novel. You don't have to have great knowledge of modern history to understand the message: this can apply at any time, anywhere. I really believe, alongside 1984, Orwell has created a timeless masterpiece with Animal Farm. It's a short and easy read, but leaves you with an abundance of things to reflect on. It is said so often, and you will see this come up as soon as you type Animal Farm into Google, but this really is a book you must read before you die.